J Dubbs has lost everything – his money, his future, his self-respect and now beloved Gramma Betty. She was really the only reason he hadn’t checked out before. He played by the rules and the rules screwed him. 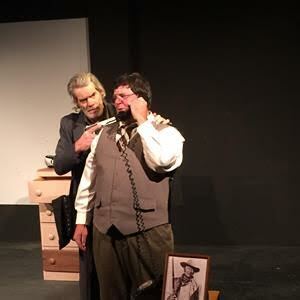 Reno playwright and actor Gary Cremeans II’s one-act tragicomedy “New Canula” is a classic double act, but with an absurdist philosophical twist you never saw in Abbott and Costello. Half of the comedy duo is John Wayne McGillicutty or J Dubbs (Cremeans), a beaten man who is taking control of the only thing he can in his sad life: his death. Noose around his neck and the instructional “Dying with Dignity” in hand, he’s intent on ending it all. But his plans are thwarted when the other half of the down-and-out twosome, Marion “Bull” DesCarzo (David Simpson), breaks into the forlorn apartment. Bull is on the run from the cops and the mob, after pulling the biggest heist of his life and planting clues to lead police to some “bad guys.” In a very real sense, his life is over as well – at least in this town. The repartée and comic timing are delightful, as tough guy and straight-man Bull feeds set ups to banana-man loser J Dubbs, who responds with snappy, self-effacing one-liners. But Bull eventually reveals his own life of failure. Ever present in spirit is omniscient Gramma Betty, whose photo rests on the dresser and whose aphorisms J Dubbs flings as carping gibes. Most tantalizing is Betty’s end-of-life reverie of nebulous New Canula, a transcendent place where all pain is soothed. But these two sad sacks aren’t content waiting for Nirvana to find them, in a sort of “Waiting for Godot” absurdism. They’re going to seek it out. Is it salvation from human tragedy or another pipe dream, a palliative, a bromide to ease the pain of a callous world? You get to decide whether “New Canula” ends with a hopeful future for two of society’s perennial losers or leads to yet another fiasco. Don’t miss this provocative blast from the comic past. “New Canula” is a thinking-person’s hour of gallows humor and wisecracks. It was accepted to the Hollywood Fringe and New York International Fringe Festivals. Yes, that’s a big deal and yes, I highly recommend it. When: July 10 – Two benefit performances at 2 p.m. and 4 p.m.